You know you're in trouble when Bill Frist makes a fool out of you in an impromptu scientific debate on a nationally-televised talk show, especially if it is your own nationally-televised talk show. Frist, if you will recall, is a heart surgeon and erstwhile Republican Senate majority leader who, in 2001, damaged his reputation as a doctor, if not a politician, by challenging the accepted diagnosis that Terri Schiavo was in a persistent vegetative state based only on viewing a videotape. This "learned" opinion was offered in support of federal legislation hastily constructed to prevent the removal of a feeding tube that was keeping that brain-dead woman alive. His professional misbehavior in this case will serve for years as on object lesson in the improper application of medical authority. That said, it appears Bill Frist knows his way around peer-reviewed medical journals and appreciates the significance of the results of well-run clinical trials. Unfortunately, the same cannot be said of Bill Maher, his opponent in their argument over the safety and effectiveness of the H1N1 (swine) flu vaccine. It would be an understatement to say that Frist emerged as the victor in this dust-up with Maher on Real Time with Bill Maher; to use the vernacular of YouTube where this clip of their debate has been posted, Maher was thoroughly pwned. This blog in The New York Times reaches a similar conclusion. The combination of intellectual dishonesty and scientific ignorance exhibited by Maher in this short exchange is especially disappointing to me, since, prior to my learning about his association with the anti-vaccination movement, I had held him in high regard, both as a comic talent and as a useful instigator of public discussion on controversial issues of the day. But, by characterizing the government as being categorically untrustworthy and by asserting that vaccinations are intrinsically ineffective, Maher demonstrated a willingness to resort both to the kind of demagoguery popular with right-wing conspiracy theorists and to the kind of misunderstanding of the theory of evolution popular with know-nothing creationists. So why single out Bill Maher for criticism? After all, there is no shortage of anti-vaccination alarmists, stirring unfounded fears about this important public health matter, although, admittedly, few with the kind of national audience that Maher commands. What makes Maher a conspicuous target for me is not his opposition to respectable medical research, per se, but the fact that, as a very public atheist, he ordinarily champions the cause for the skeptical examination of the very kind of irrational claims that support his anti-vaccination position. Maher's atheism has probably best become known as a result of his 2008 movie, Religulous, an entertaining and, at times, thought-provoking road trip through the world of mainstream and fringe religious belief. The film consists of (mostly) friendly encounters between Maher and God-fearing folk, during which the usually iconoclastic Maher (mostly) sets aside his trademark mocking tone and, instead, engages his opponents with bemused curiosity and a modicum of respect. I imagine that the relative popular success of Religulous was one reason why Maher was chosen by the Atheist Alliance International to receive the 2009 Richard Dawkins Award at their convention this month. Yet, given Maher's views on vaccination, how can his selection for this honor by a group that consistently identifies itself with scientific rationalism be explained? As far as I can tell, this misstep has something to do with a shift of the focus within the atheist community, where championing of the power of reason has been displaced, to some extent, by blanket opposition to religious belief. The resulting difference of opinion has given rise to a tension among non-believers which was featured in a recent story on NPR's Morning Edition (A Bitter Rift Divides Atheists). This dispute - not unlike the one that raged between the Mensheviks and the Bolsheviks in the years prior to the Russian Revolution of 1917 * - is primarily one concerning tactics with, on one extreme, the "live-and-let-live" atheists, endorsing an ecumenical form of constructive engagement with believers and, on the other, the "take-no-prisoners" atheists, advocating relentless confrontation brimming with contempt and ridicule. What is often lost in this internecine squabble is that the fundamental intellectual program of atheism should be based not on opposition to religion, in and of itself, but on opposition to that kind of unreason upon which religion often relies, which can be at times a touchstone for harmless personal observance and at others, the cornerstone of despicable public policy. Sometimes the purveyors of unreason emerge from within our own ranks. 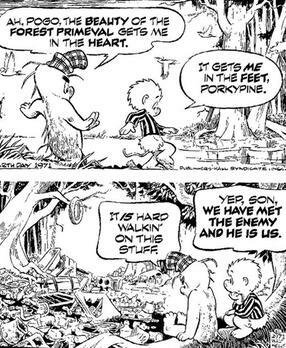 Or, as Walt Kelly observed in his most memorable Pogo quotation, "we have met the enemy and he is us." Which brings me back to Bill Maher. While the "zero-tolerance" atheist commanders have been directing a frontal assault on religious belief in all its forms, an agent of corrosive unreason, namely Maher, not only has been operating openly within their home territory, but, indeed, has been receiving citations for his meritorious service to their cause. Ironically, it would be hard to identify a religious leader in this country today who represents more of a concrete threat to the health and safety of his fellow Americans than Bill Maher. Encouraging his viewers, specifically pregnant women, not to receive the H1N1 vaccine is so reckless that it borders on the criminal. The potential danger of such misguided advice was illustrated in an article from last week's Science Times, Flu Story - A Pregnant Woman's Ordeal, which details the story of Aubrey Opdyke, who, as a result of contracting swine flu in late June, lost her baby, was hospitalized for four months, spent five weeks in a coma, suffered six collapsed lungs and a near-fatal seizure. Although Maher would likely dismiss Aubrey's story as an ignorable anecdote, as he did Bill Frist's report of the death of an otherwise healthy man in his thirties from an H1N1 infection, the facts of the matter are that her personal tragedy is incontrovertibly linked to H1N1 and that the threat posed by the swine flu virus to pregnant women has been established in carefully scrutinized epidemiological studies. In all likelihood, had an H1N1 vaccine been available before Aubrey was infected and had she been vaccinated with it, she and her baby would be living happy, healthy lives today. If the insidious recommendations of Maher and other anti-vaccination crusaders are widely adopted, many more people will become infected with H1N1, some of these will experience a fate similar to Aubrey Opdyke's, and others, ones far worse. So, now is the time for the atheist community to step up to the plate, thank Bill Maher for his service to the cause of reason in other regards, but remind him, in no uncertain terms, that the fight for rationality is not restricted to defeating dangerous religious beliefs, and that it must also confront so-called scientific claims not grounded in the results of systematic peer-reviewed research, especially claims that jeopardize public health. * The Mensheviks were thoroughly pwned. Anti-Vaccination - A Real Crime with Bill Maher by Marc Merlin is licensed under a Creative Commons Attribution-Noncommercial-No Derivative Works 3.0 United States License. Great article and this is coming from a huge Bill Maher fan and an agnostic as well. Despite me being a big Maher fan he like many other Americans has an inherent distrust in government. This is likely the result of coming of age during a period of intense and exposed government corruption coupled with an irrational and thankfully waning worship of corporate business interests. It's not just the big scandals like Watergate and Iran-Contra or the US Attorney firings of the Bush administration. It's the overall letdowns that our government has provided on a larger scale. A declining educational system, Hurricane Katrina, our fruitless military pursuits in Iraq and in other fields of battle, expanding poverty, a growing wage gap, huge deficits, and a never-ending stream of earmarks and lobbyist fueled bills from congress. All of this is of course the results of conservative governance which can only centralize its' power and validity by reenforcing a constant state of anti-government mobilization within the general populace. Our government doesn't effectively regulate or provide services and more so when a government official tells people to take a vaccine there are now a number of people that immediately take a cynical viewpoint of that. Maher's particular cynicism stems from his general and in some cases warranted fear of our food and water and the agencies entrusted to monitor those items. The FDA is one of several key government agencies often first among conservatives that govern to receive cuts in regulatory authority or staffed with former executives of the very industries they are supposed to be regulating. Witness the tainted peanut scandal of last summer in Georgia. When an intelligent and thoughtful person such as Maher falls victim to this kind of cynicism is should serve as a stark reminder that ideology and philosophy matters when it comes to elected officials. As usual, your analysis of Maher's deplorable comments within a larger context (wow! all the way to the Russian Revolution)) was enlightening - and scary! I enjoyed your blog Uncle Marc. I saw this interview with Bill Maher a little while ago and was completely baffled by his attitude towards the H1N1 vaccine. I always enjoyed Bill Maher and admired him in ways as an atheist this makes me think twice. And, despite claiming to support Ron Paul on his show, and claiming to be a Libertarian (and on other occasions `liberal'), he has often supported ``big government'' (as do I!). In short, it is dangerous to assume that a comedian like Maher is ``a serious man'', rather than a sharp-witted ``enfant terrible'', brimming with levity. 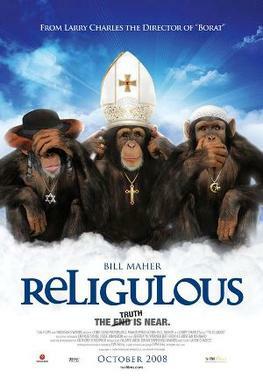 As to Maher's film ``Religulous'', although he was more polite than usual, and although I thoroughly enjoyed the film (and laughed many times), there was something unseemly about his going around the country and putting the religious beliefs of small people on film for all to ridicule. Ridicule has its place, but I think it should be reserved for big-time frauds who drain the life and blood (in the form of money) from decent folk yearning for The Truth. In the short term, outclassing such evil will leave its true believers sad and depressed, though they will recover with time; but doing the same to the believers themselves will scar them with a shame from which they might not heal. As to whether Bill Maher is, in his heart of hearts, sincere or provocative in his anti-vaccine stance, as they say, only God knows. I do not follow him carefully, but I understand that his position in this regard is consistent with a long standing antipathy that he expresses for "western medicine". This kind of ambiguity reminds me of the character Howard Campbell, a character in Kurt Vonnegut's Mother Night, who in his role of a antisemitism-spewing Nazi radio propagandist in Germany during the war is secretly passing information to the Allies. The Germans catch on to his ploy, but decide, on balance, that he is doing more to further their cause than he has to hinder it. That said, if Maher's opposition to vaccination is, in reality, part of his act, then I have misjudged him; he is far more reprehensible than I had imagined. It's one thing to advance claims that, say, endanger the lives of pregnant women as a result of genuinely held, but misguided, beliefs. It is entirely another to do so for the venal purpose of playing to the crowd. I think I shall continue to give Maher the benefit of the doubt. Your concerns about the appropriate use ridicule in the confrontation between atheists and believers was featured in the NPR piece that I alluded to in the post. I tend to agree with you that such denigration is "tactically" ill-advised and, maybe more importantly, uncivil. As you suggested, no quarter should be spared in opposing truly pernicious religious belief, but it seems counterproductive to use the big guns on harmless (and often clueless) opponents. The argument within the atheist community centers on what, if anything, constitutes "harmless" religious belief, with the most militant taking a zero-tolerance position. It will be interesting to see how this plays out. Hey M., this is Ian from the meetups. Thanks for your articulate post. Out of curiosity, when the H1N1 turns out to be a non-event of no consequence (like its much ballyhooed 1976 predecessor), will you be willing to revise your opinion of Mr. Maher here on your blog? After all, the peak for H1N1 has already come and passed (it's now late November). It could be argued that H1N1 has already turned out to be an influenza strain "of consequence" and that vaccination had something to do with mitigating its damage. But that is neither here nor there as far as my opinion of Bill Maher. This is because my criticism of him has nothing to do with whether his ability to predict the severity of flu pandemics is better or worse than, let's say, the CDC or the World Health Organization. My argument with Maher has to do specifically with his categorical and irrational opposition to vaccines, not just the H1N1 vaccine, but all seasonal flu vaccines and all vaccines early-childhood vaccines, as well. This opposition originates from a counterfactual insistence that "the government can't do anything right" and a utter misapprehension of viral evolution. His thesis also ignores the historical evidence offered by the successful eradication of smallpox and the near eradication of polio. Now if Maher were to have made a claim in advance about the damage to be wrought by H1N1 - perhaps he did, I don't know - I would have, as with any claimant, asked to see at least a summary of the peer-reviewed scientific research that underlay his claim. Psychics make "accurate" predictions every now and then, but such success does not imply good judgment on their part or that we should forever heed their advice. The position implied in your brief comment, independent of the matter of Maher, would seem to be an argument against reasonable prudence. The world encompasses a range of extraordinarily complex phenomena which unfold in ways that cannot be predicted with certainty. To the extent that we are concerned about dealing properly with potentially devastating outcomes, we have little choice but recourse to the best science and statistical modeling we have at our disposal. (See the global warming debate for comparison.) Our best predictions may turn out to be wrong, but what else can we do? Not prepare? Just a brief note to underscore that H1N1 continues to be a disease of "consequence" and that vaccination is still encouraged when appropriate. There has been a “worrisome spike” in secondary bacterial infections among Americans with swine flu, federal health officials said Wednesday, urging more people at risk to get the underused vaccine that prevents some of those infections. 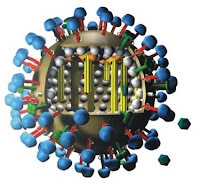 "The vaccine - as Johannes Löwer, president of the Paul Ehrlich Institute, has pointed out - can also cause worse side effects than the actual swine flu virus." This, coupled with the fact that H1N1 is less intense than other seasonal flu outbreaks, begs the question of why so much interest in forcing people to take it. The officers of the German government were given a modified vaccine since the regular is so toxic. "Swine flu is not very different from normal flu. “On the contrary if you look at the number of cases it is nothing compared to a normal flu outbreak,” he added." Prudentially, I think it makes sense not to take the shot. Over 60% of the American public either agrees or is indifferent. At this point, it's immaterial anyway since the outbreak is past its peak. If having only 30% of the population vaccinated has prevented a true pandemic, then I'd like to see this corroborated in peer review journals. Something of course a little more substantial than the science practiced by CRU. Meaning, no more "models" cooked up with corrupt databases, cartesian products, non-thread safe data writes, suppressed data, altered inputs, etc. as the warmists use in justifying the elaborate creation of a new medieval system of indulgences. I do understand that there are notable people who believe that the H1N1 (swine) flu strain presents no particularly unusual threat and that the vaccine is unsafe. But, I imagine, you would have to agree that for every citation you offer in support of these claims I could offer citations from notable people who disagree. I doubt that our claims of greater authority for these individuals - on your part or my part - would prove anymore persuasive, primarily, since I don't believe we yet share a framework for assessing the validity of the competing positions. That said, I'd like to avoid, at least for the time being, a contest over who is "right" about H1N1. It is a dispute occurring this very moment in tens of thousands of forums all over the world. I doubt that you or I have anything to offer other than a faint and redundant echo of that debate, even though we both might imagine that we have *the* winning quotation or compelling study in hand. So instead of engaging in a me-too fracas about H1N1, allow me to try to move the discussion in a constructive direction. Given that we will inevitably be presented with the unfolding of natural and human-instigated processes which may threaten the health and welfare of the people on this planet - pandemic viruses and climate change, for example - and given that notable individuals representing credible research institutions will offer a range of opinions and findings, which not only differ, but even deny (perhaps accurately) the existence of such threats, how do we go about - rationally and systematically - comparing these points of view and determining, if any course of action need be taken in response to the hypothesized threats, what that course of action should be? This is what I mean by devising a shared framework for resolving our dispute about H1N1, or any similar scientific controversy, for that matter. Without such a framework, our argument degenerates into simple contradiction, as amusingly illustrated in a famous Monty Python sketch. So what framework do you propose for helping us resolve the position we should take on controversial policies related to matters of scientific concern? I was simply pointing out that people should be allowed to make their own choices about what goes into their bodies and that there is significant scientific room for doubting the hyperbolic tenor of H1N1. It's simply not accurate to say that the prudent thing to do is to take a vaccine with a questionable provenance and with side effects that are worse than the disease itself in some cases. To your question about what positive aids for controversial policies I would recommend: I've several, but I'll stick with what I know, computers. I had a chance to read another Dutch programmer's review of the software used to concoct the sham models used by the U.N.'s IPCC and CRU and National Climate Reseach Center; one to justify sweeping changes to Western society. One of the things that struck me is that the code was only reviewed because it was stolen; but the trend even among Microsoft developers like myself in recent years has been towards open source. Code is given out to the community at large for review and critical feedback. Think of it as "peer review." Software devs in my long career are by nature rightist/libertarian in their general outlook and prefer transparency and natural selection through open processes to closed society-style processes (think Karl Popper). I would like to see that more of these "models" used by scientists uploaded and then reviewed through a formal process. Some of the code comments I saw today -- about suppressing figures from the 1960s onwards since these reveal a worldwide cooling trend -- would be read potentially by thousands of developers. There are developers all over the world who read open source code in their free time. This is a good, righteous libertarian thing; remove the money interest and let craftsmen who love their craft have a shot at seeing what these models are really made of. No longer will scientists be able to say, "Well, our models show X" without thousands of developers being able to verify such claims. I realize from recent reading that the CRU had released some of its data, but the point is that a significant amount of code was never publicly reviewed even though vast portions of the web are now run under open source. In other words, scientists with vested monetary interests in pushing a radical policy which would harm countless poor people in the developing world, should not be allowed to decide whether to delete or hide data requested under FOIA provisions. More of their work needs to be transparent and no scientist should ever be allowed to decide whether or not publicly subsidized research is hidden. I was simply appalled at comments to this effect among the warmist leaders. There is no such thing as science in the Platonic sense used by so many scientists. There is no pure dispassion, there is no perfect objectivity. The CRU scandal reveals just how passionate and emotional scientists are. Therefore, the best way to insure that the scientific method is not discredited in the public eye is to make it more open and to remove the financial incentives which predispose scientists to conclusions which favor them and their jobs. Science cannot be turned into medieval religion and this has been the trend in recent years among those writing for public audiences.